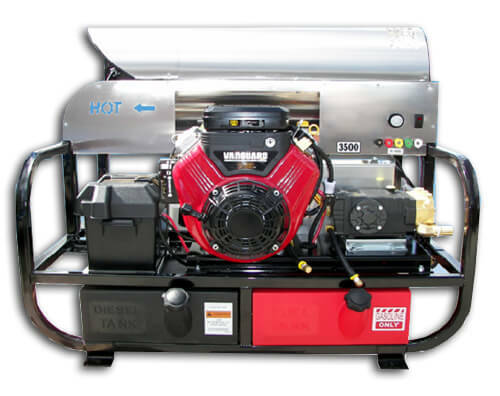 The CH gasoline engine series are designed to be mount on a trailer or truck thanks to their stationary base (4 forklift tines). The pressure ranges are from 3000PSI to 7000PSI and the water volume ranges are from 3.5 GPM to 8.0 GPM. All machines are factory tested before delivery. 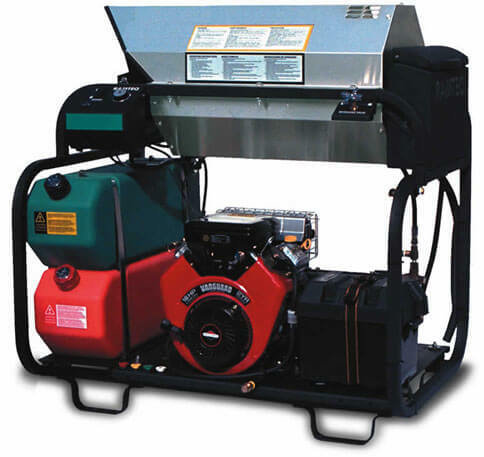 The high quality construction, super efficient burner design, 15 gallon poly tanks (largest in our industry on standard built model), well respected General 47 frame pump with 4 V-belt drive, industry proven 13-28 hp Honda engine, coupled with our ability to ship timely, accurately, discreetly, and now at even MORE COMPETITIVE PRICING, this unit is one of our BEST VALUES EVER!!! 15 Gallon poly diesel and gasoline fuel tanks with fuel filters, Please Note Exception: 4012PRO-10G, and 5012PRO-10G have 15 Gallon poly diesel and 1 gallon gasoline fuel tank. 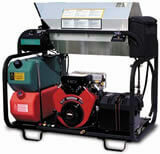 LH Series - They incorporates a brand new generation and modern style of electric powered / diesel fired hot pressure washer. This series comes with the cart of your choice of either 4 pneumatic tires or 2 pneumatic tires and a rear support tine. 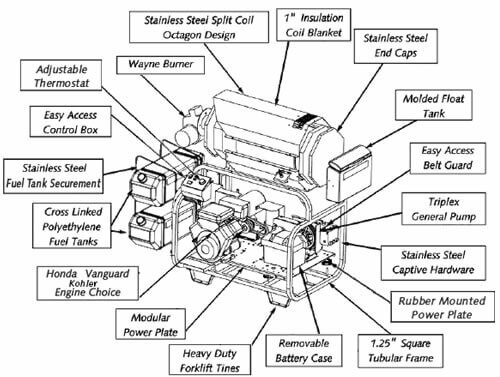 All models are available as direct drive or belt drive machines.